Revolutionize the way you cook outdoors with a Memphis Pellet Grill! These versatile BBQs combine high temperature grilling for searing steaks and other meats, low and slow cooking for that delicious smoked flavor and can also act as a convection oven. 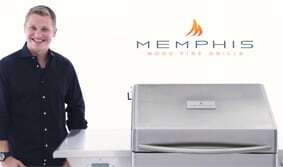 And the wood pellets used on your new Memphis Grills BBQ are more environmentally friendly than other grilling products. Great BBQ flavor and less carbon footprint. What more could you ask for?